Hi! My name is Donna and I'm so glad you are here! 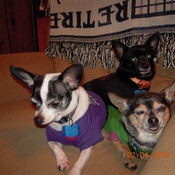 I am a wife, mother, grandmother and guardian of 3 chihuahuas! I will be listing different types of items, some will be used and some new, so there should be something for everyone. You will find music, books, collectibles, stamps, coins, new and used clothing and much more. Used clothing will be washed or dry cleaned,depending on the fabric, before being listed. I managed various dressbarn stores for 18 years and have many items that were worn only a few times, some not at all. Please feel free to ask me questions about any of the items I have listed. I will combine shipping on similar items to save you $$$. Just ask!! I'm always asked, the answer to my handle: I love my PT Cruiser and we love going to the beach!! pt2bch doesn't have any items in their booth!